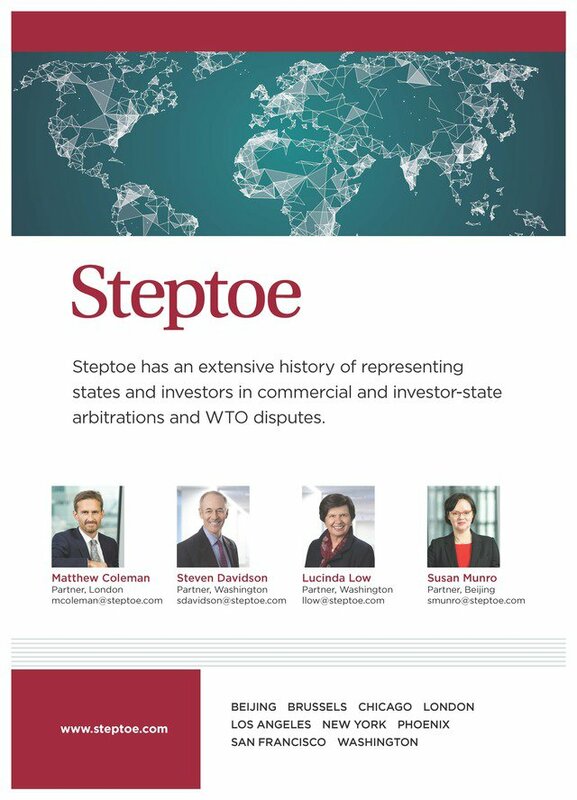 US-based Steptoe & Johnson has worked on arbitrations since the early 2000s, but 2016 was its breakout year after it achieved outstanding results in a pair of ICSID cases against Zimbabwe. The firm picked up a GAR Award in that year in the category of “international arbitration practice that impressed” and featured for the first time in the GAR 100 in 2017. The modern arbitration practice took root when Steven Davidson in Washington, DC helped Motorola launch multiple claims against Turkish businessman Cem Uzan and his family. That dispute led to successful enforcement proceedings and the second ICSID claim ever filed against Turkey, which the firm settled in the mid-2000s. The firm went on to hire Lucinda Low in Washington, DC, who acted in some early NAFTA cases and was among the first US lawyers to argue a claim before the Iran-US Claims Tribunal. Although more of a name in the field of anti-corruption (she heads the firm’s compliance and investigations practice), Low is increasingly visible these days as an arbitrator at ICSID. In 2007, the firm recruited partner Matthew Coleman in London, who now heads the investment treaty arbitration practice. Coleman brought with him three cases against Zimbabwe, including one that featured the largest ever number of claimants in a single ICSID case. The practice received a further boost in 2019 with the hire of Teddy Baldwin from Baker McKenzie, who brings a busy portfolio of investor-state work. Chris Paparella joined the firm's New York office as partner, arriving from Hughes Hubbard & Reed. Other names to know in DC include Mark Moran, who has experience in international trade disputes before the WTO; and Brian Egan, a former legal adviser for the US State Department who joined in 2017. London and DC are the main offices for arbitration, with other practitioners in New York and Beijing. Steptoe & Johnson’s private clients include ExxonMobil, GlaxoSmithKline, Cigna Insurance, Canada’s Northern Dynasty Minerals, Motorola, British satellite company Inmarsat Global and South Korean consumer electronics group LG. The firm is representing investors in claims against Montenegro, Tanzania and Venezuela, having previously acted in claims against Turkey and Jordan. It helped Canada defeat two NAFTA claims in the mid-2000s. Other government clients are Argentina, the Dominican Republic and South Korea. The firm has also been helping China to negotiate an investment treaty with the EU. Steptoe & Johnson’s most impressive results to date have been for the von Pezolds, a Swiss-German family of farmers, in a pair of ICSID claims against Zimbabwe concerning the controversial land reform programme of former president Robert Mugabe. The firm won a pair of awards in 2015 requiring the state to return land it had expropriated or pay US$195 million in compensation. An ICSID annulment committee upheld the awards in November 2018. It was one of the first ICSID matters to consider discrimination on the basis of race, and one of the few where restitution was ordered as a remedy. It also acted for African regional bank Ecobank in a dispute with its disgraced former CEO Thierry Tanoh that played out in an UNCITRAL arbitration, as well as litigation in Togo (where Ecobank is based), Ivory Coast and the UK. The dispute settled in 2016. Steptoe helped British satellite company Inmarsat Global obtain a US$50 million ICDR award against Houston-based technology company RigNet, with counterclaims still to be decided. It defended South Korea’s LG from a US$500 million claim brought by Microsoft at the Finland Arbitration Institute. The firm says the case was successfully resolved on confidential terms. It helped two insurance companies conclude arbitrations relating to coverage for the Deepwater Horizon oil disaster in the Gulf of Mexico. For Japanese roadbuilder Konoike, it obtained a default judgment from a US court confirming a US$60 million ICC award against Tanzania. The firm continues to represent Italian-owned companies in a US$30 million UNCITRAL claim against the east African state over the expropriation of a farm. Other pending cases include a US$100 million UNCITRAL claim for a subsidiary of Scotland’s Ramco Energy against Montenegro over an oil and gas concession in the Adriatic Sea. Teddy Baldwin, the firm’s new recruit in DC, has brought some pending matters with him, including an ICSID claim against Venezuela brought on behalf of a Barbados-registered oil services provider. He also continues to advise real estate investors in a claim against the Dominican Republic; and Indian investors in a US$40 million claim against Bosnia and Herzegovina, both at the Permanent Court of Arbitration in The Hague. Baldwin is also advising Guatemala in its efforts to resist enforcement of a US$21 million DR-CAFTA award in favour of Florida-based TECO Energy. Steve Remp, chairman of Seawind Capital, singled out Steven Davidson in DC. “He’s a real international statesman, and has pleaded and won some very big investor-state cases,” Remp says.